You can view any ticket you previously sent DreamHost in your panel on the Contact Support page. You can also view your Support History by viewing the History page. This page also displays any messages DreamHost has sent you. If you have a ticket that support has not yet responded to, it will show at the top under 'Open Tickets'. You can click the 'Withdraw' link to the right if you wish to close it. Otherwise, support will respond back to you shortly. If you have previously submitted a ticket, a silhouette icon appears to the left. 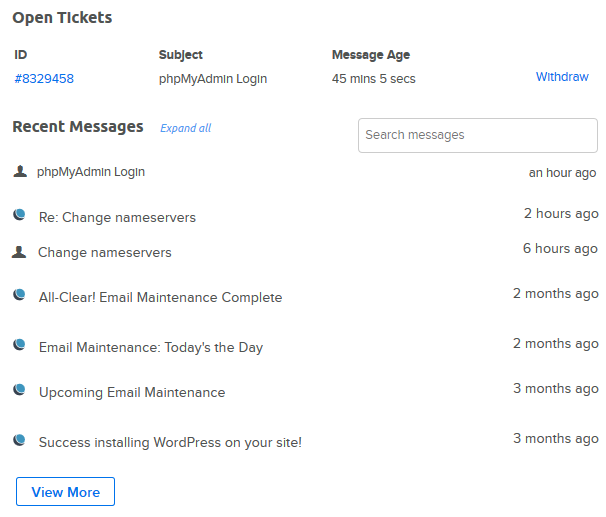 In this example, tickets titled 'phpMyAdmin Login' and 'Change nameservers?' were submitted. You can click these messages to view their contents. If DreamHost has already responded, you will see a moon icon to the left of a ticket starting with 'Re:'. In this example, the DreamHost response is titled 'Re: Change nameservers'. You can click this message to view its contents. DreamHost sends you account messages when an event directly related to your account occurs. These message also display a moon icon to the left of the message. In this example, DreamHost informed the user that 'Email Maintenance' was scheduled for their account. Whenever you make a change to your account, the panel sends you a ticket confirming the action. In this example, WordPress was installed, so a message titled 'Success installing WordPress on your site!' appears.